Learn everything you need to know about making Windows 10 easier to use, see, hear, touch, or read, whether you are using it yourself, setting it up for another person, teaching others about ease of use at work or in the home, or working with a variety of people with specific needs in the community. 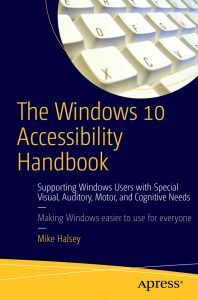 The audience for this book includes (but is not limited to) Windows users with special visual, auditory, motor, and cognitive needs, at home and in the workplace. It provides guidance for IT and management professionals who work with such users, as well as the community and statutory groups, organizations, colleges, universities, and government agencies that support them. It is also a guide for friends and family supporting elderly or disabled Windows users in the home, and for anyone else looking for advice on how to make their PC simpler, easier, more productive, and ultimately more enjoyable to use.